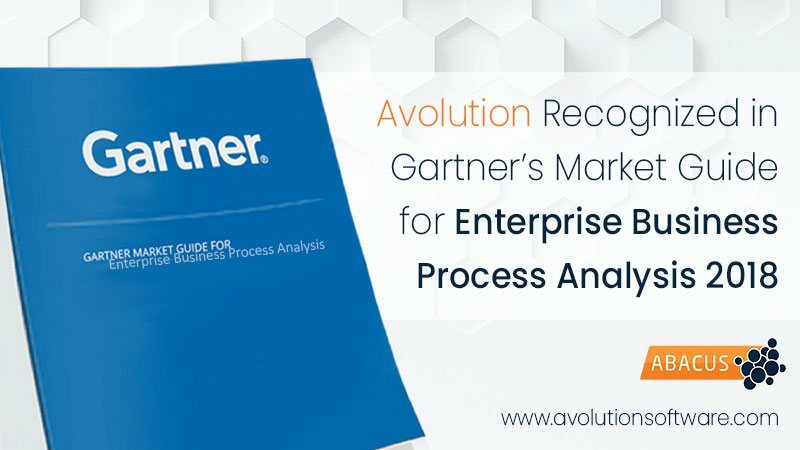 Gartner Inc., a leading industry analyst firm has listed Avolution, modeling and analytics specialist, as a Representative Vendor in its November 2018 “Market Guide of Enterprise Business Process Analysis”*. Avolution was mentioned for its ABACUS toolset. ABACUS supports business process modeling, analysis and visualization, and supports practitioners planning both strategy itself and steps required to execute on strategy. The guide identifies Enterprise Business Process Analysis (EBPA) as “the discipline of business and process modeling aimed at transforming and improving business performance with an emphasis on cross-viewpoint, cross-function analysis, and strategic and operational decision support”. According to the report, the EBPA market can be segmented along four use cases, each of which has its own stakeholders, roles, objectives, and related features and functionality; Supporting Digital Transformation by Linking Strategy to Execution, Improving Processes by Process Modeling and Analysis, Assessing the Impact of Change by Connecting Process Models with EA and Modeling and Preparing Business Processes for DigitalOps. Avolution’s Dr Tim O’Neill said: “We believe our inclusion as a Representative Vendor in the Gartner Market Guide validates why practitioners responsible for business-critical systems and processes in global enterprises rely on ABACUS to support both strategic and tactical decisions. “They can connect, structure and model business and technical data, gaining a real-time view of the technology and operations. They can also calculate business metrics and run detailed scenario analysis with tailored algorithms and analytics available in ABACUS,” O’Neill continues. Avolution’s latest release of ABACUS 6.0 provides strengthened collaboration features bringing business process modeling and enterprise architecture to the heart of digital business operations. ABACUS 6.0 offers features which streamline business-wide data management and communications, including user-friendly browser-editable spreadsheets and dashboards which can be embedded in workplace social software such as MS Teams and update directly to the central data repository. Bulk data integration can also be managed via the tool’s enhanced readable and writeable REST API and a comprehensive range of data integrations including SharePoint Sync, MS Office, ServiceNow, Technopedia and CMDBs. Avolution was recently recognized as a Leader in the 2018 Gartner Magic Quadrant for Enterprise Architecture Tools**, published October 2018. ABACUS is currently available for both for on-premise, cloud (as a browser-based web-app), or hybrid deployments.